Hey Guys! So I told you the other day that I was going to ombre my hair and that I was pretty scared about how it was going to turn out. Well I needn’t have, my friend Katie did it for me on Friday and I love it!! I used the Jerome Russell Bblonde Highlighting Kit and it was pretty easy to do. You have to use a bleach to ombre your hair, to strip away the colour, and if you use just blonde dye it won’t work, it will probably just turn out ginger so make sure whatever your using has bleach in it. Katie is not a hairdresser or anything like that but I don’t think it would have came out any better at a hairdressers. I know that a lot of people ombre their hair themselves but I think that it’s a lot easier if you can get someone to do the back because it’s hard to see if it’s coming out even. If you are going to do it yourself, I’d suggest having a mirror in front of you and another behind you so that you can see how the back is coming out as your doing it, or just divide your hair in half, pull it to the front, put the bleach in and check how it looks from the back in a mirror before you let if set. I would also recommend that you wear old clothes because the bleach can stain them. In my random haul earlier this week, I bought two boxes of the Jerome Russell Bblonde Highlighting Kits because I thought that I mightn’t have enough dye but I had more than enough in just one. It was pretty simple to use by just following the instructions. You mix the powdered bleach included with the little bottle of peroxide using the brush provided. You then have this blue mixture. I didn’t want my hair to just go from brown to blonde, but wanted more of a fade effect so we decided to do the real bottom of my hair first so that would be more blonde then the rest. We put that on and waited about five minutes, going over some of it again as we waited. We brushed it through with a tangle teezer so that the dye didn’t miss any hairs and so that it wouldn’t end in a straight line (you could use any hair brush). 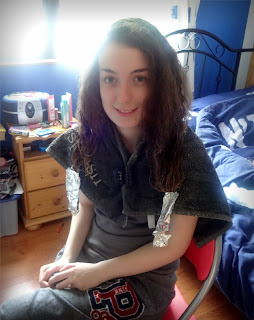 We then put more of the dye up further and brushed that through and the by the time that was done, we went up a little bit further. A lot of people start their ombre just under their chin but we only went up to about my shoulders. My hair with most of the bleach on. You can see the blonde developing. Because we could see the blonde developing in my hair we could tell when it looked like it was ready so I could wash it out. When it was near the colour I wanted, we went over the ends with bleach and then wrap them in tin foil to make that hair blonder.